Preparing your home for winter means more than giving your furnace the once-over and turning off the outside faucets. It means locating and sealing the leaks in your home, too. While all air leaks should be taken care of, the most common areas are around windows and doors. 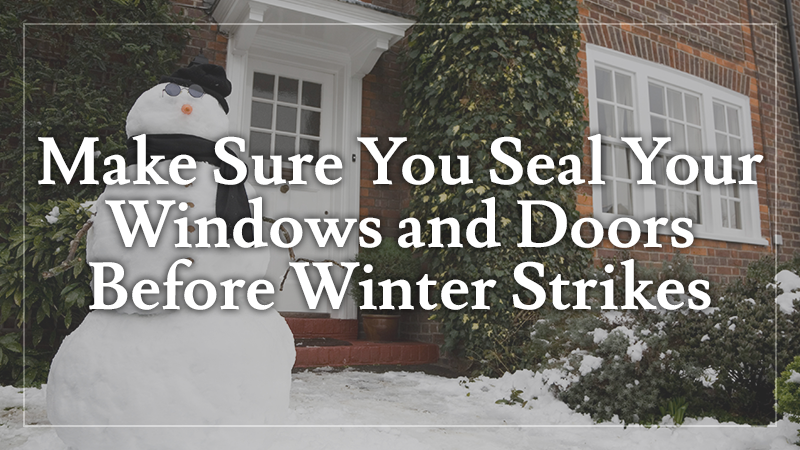 Here’s what you need to do to locate and seal air leaks around your windows and doors. Check the outside of your window frames for loose screws and replace them if necessary. Likewise, check storm doors and outside doors to make sure the hinges are secure and all panels are in place. This includes cellar bulkhead doors and basement windows, too. Use caulk or silicone to fill in any cracks around the frames to keep that cold winter air out of your home. There are several options for covering your windows with plastic. You can purchase heat-activated shrink wrap window kits that fit over the inside of your windows, use bubble wrap or cover the outside of the windows with heavy duty plastic. To install shrink wrap plastic to the inside of windows, attach the plastic with the enclosed strips and use your hair dryer to shrink the plastic and make a tight seal. To use bubble wrap, cut it to the size of your windows panes. Moisten the window with a spray bottle and press the bubble wrap in place, smoothing out bubbles. For outside plastic, you will need to attach the plastic to the entire window frame with wooden slats designed for this purpose. You can buy both shrink wrap window kits and rolls of plastic and slats for outside plastic application at your local home improvement store. Bubble wrap is easy to find in the office supply section of most stores. 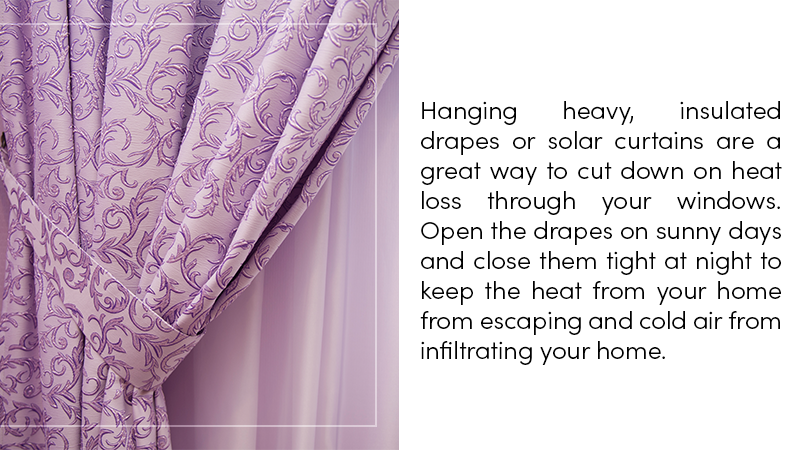 Hanging heavy, insulated drapes or solar curtains are a great way to cut down on heat loss through your windows. You can even double up and use solar curtains beneath your drapes. Open the drapes on sunny days and close them tight at night to keep the heat from your home from escaping and cold air from infiltrating your home. You can also purchase solar film to apply directly to the window panes. The film allows light from the sun into the room while preventing warm air from escaping. Draft dodgers are great for both windows and doors and work to block cold drafts that come in under the door or at the windowsill. You can purchase draft dodgers at your local home improvement store or make them yourself. Simply sew a tube of heavy-weight material to the width of the door or window and fill it with dried beans or rice. This will give it enough weight to stay in place and will stop cold drafts from entering your home. These come in a variety of creative designs or can be made with fabric to complement your home decor. For more ideas on ways you can winterize your home and stop cold air in its tracks, contact us and arrange for a consultation today!